I’ve decided to start a website/blog called Locus Solus: The New York School of Poets that will be a kind of gathering place for news, links, and commentary on all things related to the New York School of poets and artists. This site came about because I’ve long felt the need for a place on the web that would be specifically devoted to collecting and aggregating information, scholarship, news, resources, and reflection on the New York School of poets, broadly defined. 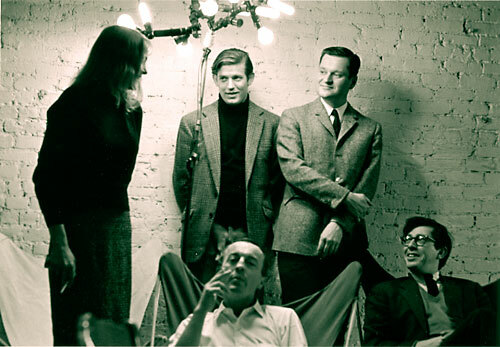 It also focuses on the writers, artists, musicians, and other figures who influenced the New York School, as well as on the movement’s profound legacy for later writing, art, and culture more broadly. I hope you’ll check it out here, and please let me know if you have suggestions of things to post or link to. The book features a really interesting array of essays by some excellent scholars and poet-critics, including Linda Russo on Philip Whalen and Joanne Kyger, Daniel Kane on Patti Smith and the Poetry Project, Lytle Shaw on the poetry community in Bolinas, Peter Middleton and Barrett Watten with essays on Language poetry, Maria Damon on Flarf, Ross Hair on Lorine Niedecker and Jonathan Williams, Ann Vickery on Jennifer Moxley, and Duriel Harris, Dawn Lundy Martin, and Ronaldo Wilson on the Cave Canem / Black Took Collective poetic community. I’m honored to have my own work in such company. My essay examines the little-discussed and rather rare phenomenon of cross-gender collaboration. It focuses on a fascinating poem, “Engines,” that was co-written by Rae Armantrout and Ron Silliman in 1982. I argue that the poem self-consciously explores a host of interesting questions about gender, the nature of collaboration, and the problematic yet generative relationship between women poets and Language poetry, both as a movement and as a community.